A little historical background about GTK. The series was created to address the perception that the Australian youth audience was being poorly served by commercial radio and television and that much important international music, and especially Australian popular music, was being ignored by commercial TV and radio at that time. GTK ran for ten minutes and was broadcast daily from Monday to Thursday at 6.30 pm just before the ABC's popular rural soap opera, Bellbird. 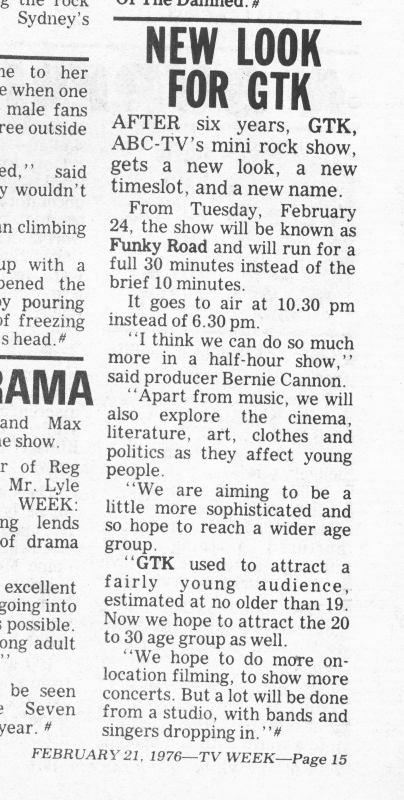 The first series of GTK premiered on 4th August 1969. It was directed by noted TV and event director, Ric Birch, who was at the time the youngest director in Australian television. Reporters on the series included Adam Bowen, Jeune Pritchard, Julie Clarke, Garry Hyde and Marilyn McIntyre. GTK's magazine-style format gave strong emphasis to local Australian rock and pop music as well as alternative art and culture. It included interviews, reports, music film-clips, "live" performances, and periodic footage of local and visiting international acts touring Australia. Since colour television was not introduced in Australia until early 1975, most of GTK was shot on black-and-white film or videotape, although segments of programs circa 1974 are known to have been shot in colour. With the start of colour television a lot of material was taped on 2" videotape masters and then later wiped.....thus many GTK shows from 1975 no longer exist. The live performance segments were filmed in Studio 21 at the ABC's Gore Hill complex. Recent estimates from the ABC indicate that as much as 90 percent of the series has survived, although regrettably most of the first year of the show was only videotape, which has since been erased. However most of GTK from its black and white days up to 1974 survives on film, including at least seven segments related to the Aquarius Festival in Nimbin in 1973. GTK finished with the 1975 season and was replaced with Funky Road for the 1976 season with the same GTK producer, Bernie Cannon. Funky Road with producers Stephen McLean, Bernie Cannon, and Albie Thoms started airing on 24th February 1976 as a repackaged GTK that ran for 30 minutes instead of 10 minutes. It moved to a weekday 10:30 pm slot. GTK and it successor Funky Road co-existed with Countdown for a period of time. Countdown started in 1974 with presenter Ian "Molly" Meldrum and various guest hosts. It was initially broadcast on Friday evenings, then later on Sunday evenings at 6 pm with a repeat on the following Saturday.